(Nanowerk News) Molecules of hydrogen are difficult to steer with electric fields because of the symmetrical way that charges are distributed within them. But now researchers at ETH Zurich have found a clever technique to get a grip on the molecules. Their findings are reported in Physical Review Letters and highlighted in the September 14 issue of Physics. 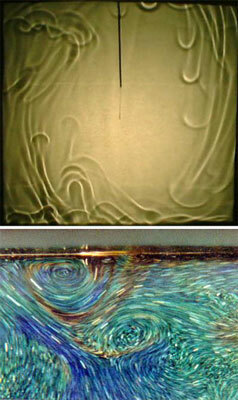 On the top is a shadowgraph visualization of rising and falling plumes in a turbulent fluid. On the bottom are small liquid-crystal spheres show the temperature and velocity in a fluid simultaneously. (Top image: X. D. Shang, X. L. Qiu, P. Tong, and K.-Q. Xia, Phys. Rev. Lett. 90, 074501 (2003); Bottom image Y. B. Du and P. Tong, J. Fluid Mech. 407, 57 (2000). Electric fields can easily manipulate electrically asymmetric molecules like water, but electric forces can't overcome thermal motions for highly symmetric molecules like H2. In the 1980s, researchers in search of a way to manipulate non-polar molecules proposed a trick: excite one of H2's two electrons into a high orbit, disrupting the molecule's symmetry. The far-flung electron feels the pull of the electric field and drags the rest of the molecule along, rendering H2 as manageable as a puppet on a string. Now Stephen Hogan, Christian Seiler, and Frederic Merkt at ETH Zurich have made this idea reality by overcoming a key problem: an electron in an excited orbit usually reverts to its ground state long before researchers can take advantage of the molecule's maneuverability. They studied several excited orbits in detail, found the longest-lasting ones, and used lasers to select these special states from a group of hydrogen molecules. The newly manageable molecules could be slowed down and trapped for 50 microseconds, plenty of time for the team to study them in detail. Minute magnetic particles, whether bonded to plastic tape or coated onto a hard disk, are the basis of modern data storage. Information is encoded in the magnetic orientation of these nanoparticles, but particles can sometimes switch orientations spontaneously, which can potentially corrupt data. Now researchers from Lawrence Berkeley and Argonne National Laboratories report that this switching unfolds in a more complicated manner than was previously thought. Their work is published in Physical Review Letters and highlighted in the September 14 issue of Physics. Scientists have long known that spin flipping becomes more likely as the size of a nanoparticle cluster dwindles. But Stefan Krause and his team discovered that this is not the end of the story. Flipping happens as a kind of chain reaction along a cluster, and the shape of a cluster can help or hinder this propagation. Manipulating the shape of a cluster and even inserting impurities can determine whether a switch is more or less likely to be triggered and propagate, potentially adding a new dimension of control to the design of magnetic devices.